First there was Blue. She came to us from the great blue, the wild blue, as blue as Lightin’ Slim, singing pigeon blues, not Rooster Blues. She came on banded foot, born of two other Blues who gave our Blue her azul feathers and fuchsia feet … in a lineage that swept back through the blueness of her grandparents and past the great grandparents before them. They all commanded the skies and taught Blue, through genes and ingenuity, to carry on forward when the color of blue left her own skies. 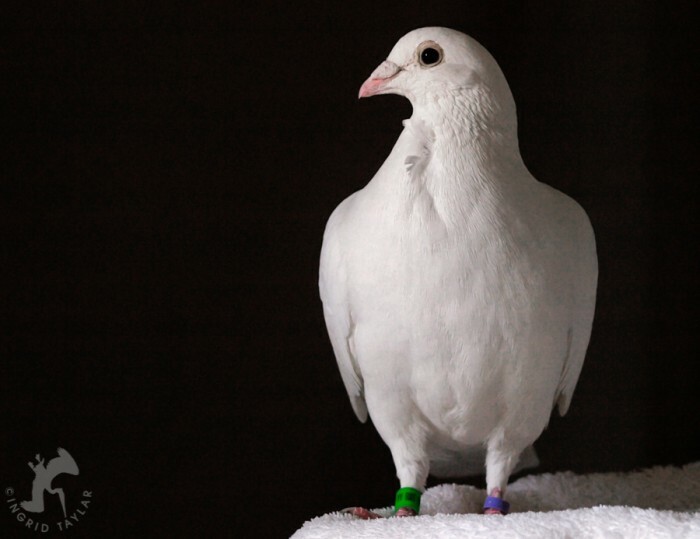 She landed more than a decade after her wings first launched into flight, a decade after the first time she was jostled in a racing cage to places unknown, then sprung from the box to somehow find her own way home. A decade after all that, she landed hungry, tired, and lost — lost for whom or what we can never know. 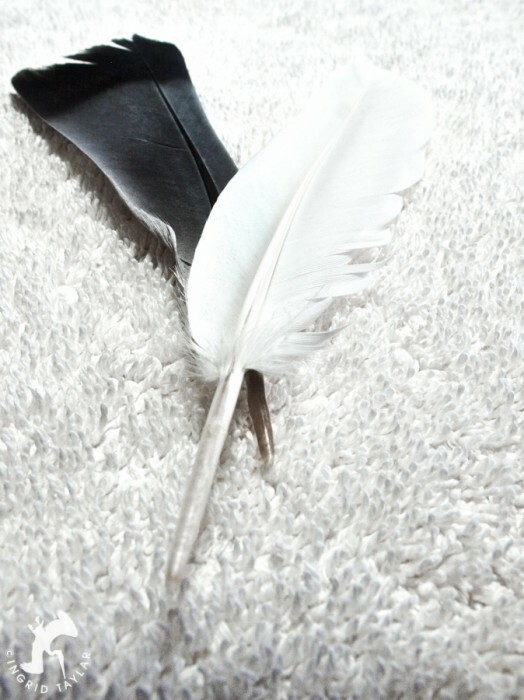 The only tie to her bloodline was etched in black and white around her ankle where the band scraped her aged skin. 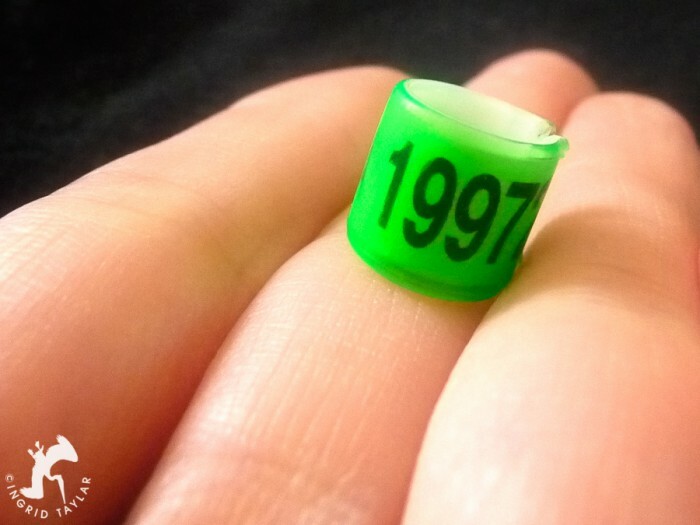 It revealed nothing more than a number no longer traceable to anyone or anything. Blue arrived with maladies so we gave her medicine. She slept by me while I wrote my papers, and watched me with the soulfulness of all who exist — viable and sentient. She bathed in the sacred waters of her plastic tub. One day, we decided to cut her free from her banded history once and for all. 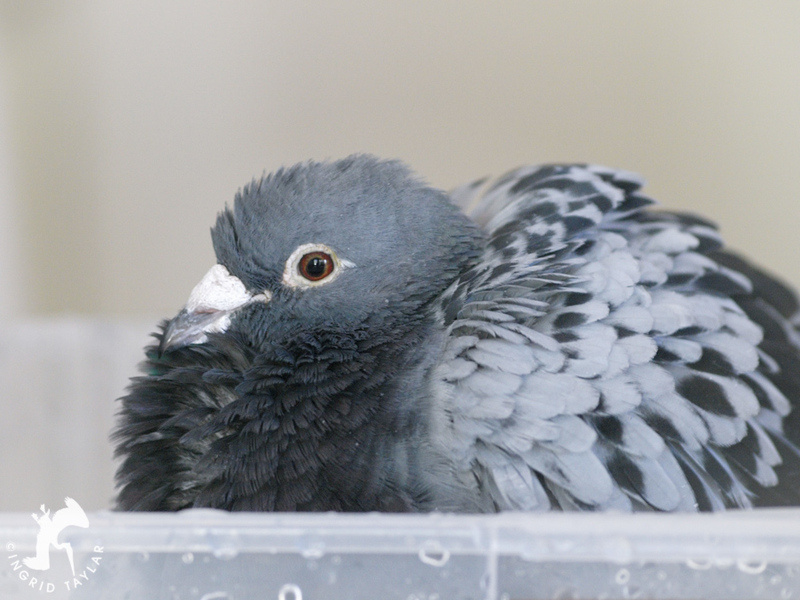 The vet said to Blue, “you are the most muscular bird I’ve ever held.” She was — incredibly muscular and strong as racers are bred to be. “We’re taking off these slave bracelets right now,” the vet added. Then with a gentle snap of her tools, she removed forever the human mandates from Blue’s avian life. We brought her home where for hours, she marched and lifted and preened her ankles. I knew, as well as any of us can know, that she felt just right again. Blue could now be her blueness. But what does that mean for one of ancient blood, destined to flock and fly and be free, but now facing life alone and vulnerable and domesticated? The answer came in the color White. White, a “he,” was as destitute as Blue had been and even more so. He was kept in a cage on wheels with a name tag that said “Snowflake” and with a bloody mess of a hawk hit on his breast. 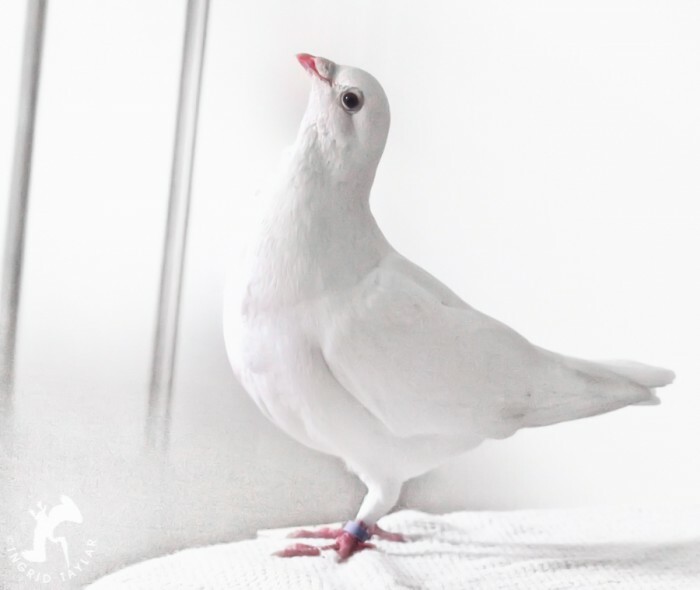 The shelter workers pushed Snowflake and his cage on that wheeled tray into the hallway when they disinfected his bird room and cleaned his wounds. And they put up a sign, hoping that someone who loved the Blues and Whites of the world would see it — that here was a Snowflake in need of home, heart and healing. One of my friends is just such a person and much, much more. She can almost hear the silent, cosmic cries of needy birds — and it was because of her that White found himself with our Blue. In the sacred waters of her plastic tub. And then, in the nest box we set up with fleeces, which White decorated on his own with tobacco twigs and coffee stir sticks we’d leave out for him to find. In fact, White became a master builder of artistic dimensions with those stir sticks. Loyally, Blue sat on the pile of sticks no matter how high it grew, and I thought she was like the Princess and the Pea in reverse — that she could feel something soft and fleecy under the hard edges of White’s construction. 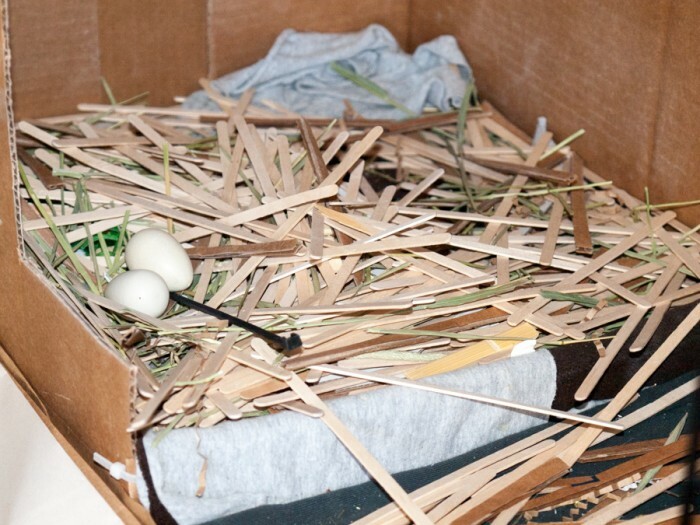 In rescue, it’s a sad thing for the birds and an often heartbreaking task for the caretakers, that the real eggs are replaced with wooden replicas to spare even more unwanted birds from being born. The birds sit on the wooden eggs with dedication and purpose, but those eggs never hatch. 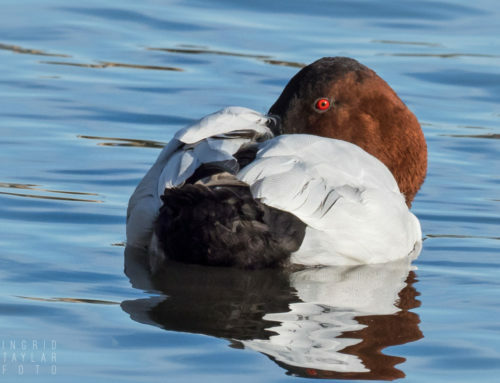 When that day of recognition would come for Blue and White, I’d see Blue slough off the role of incubator, rise up from her month-long sit, stretch her wings and then resume the routine all over again when next eggs came around. 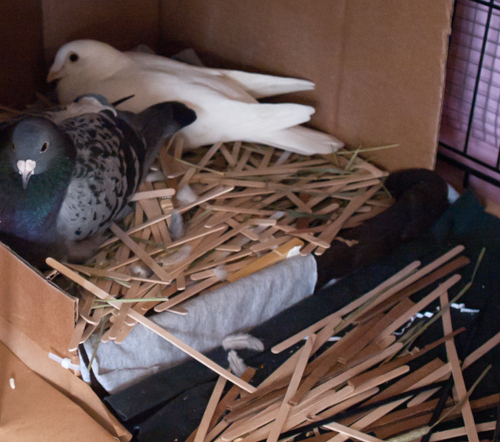 In the nesting box below, White also included a clothespin, some hay stems, and a plastic tie wrap he found somewhere. 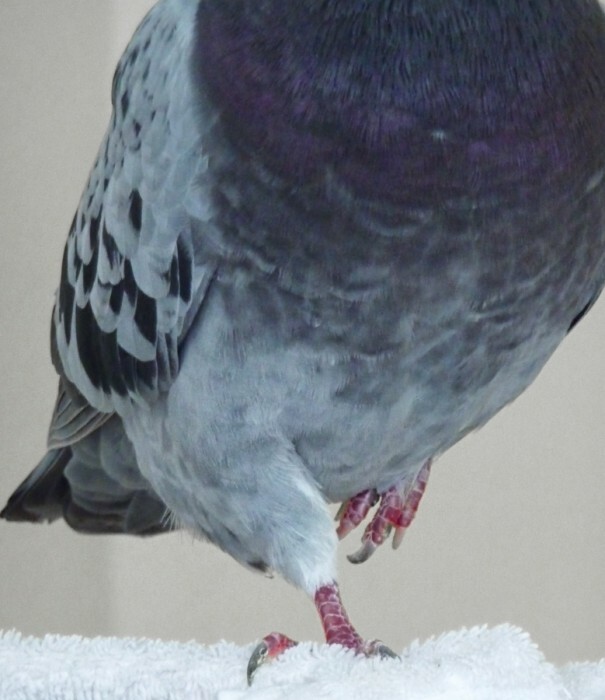 You can see how pigeons get themselves in trouble and entangled around the ankles when you watch them scout for nesting materials. 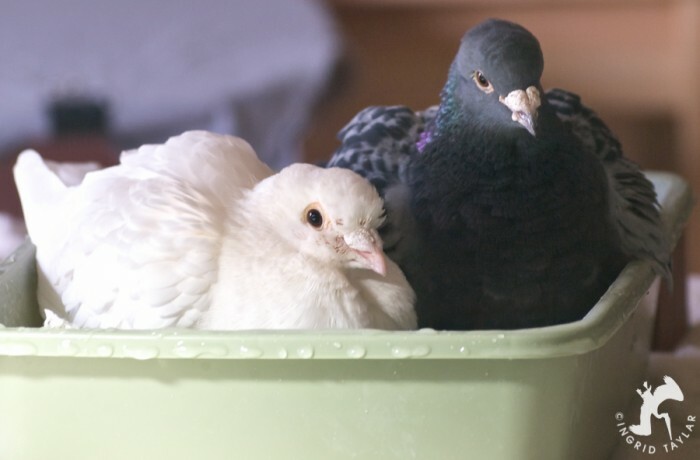 Blue and White were now bonded in cycles that only pigeons can know. 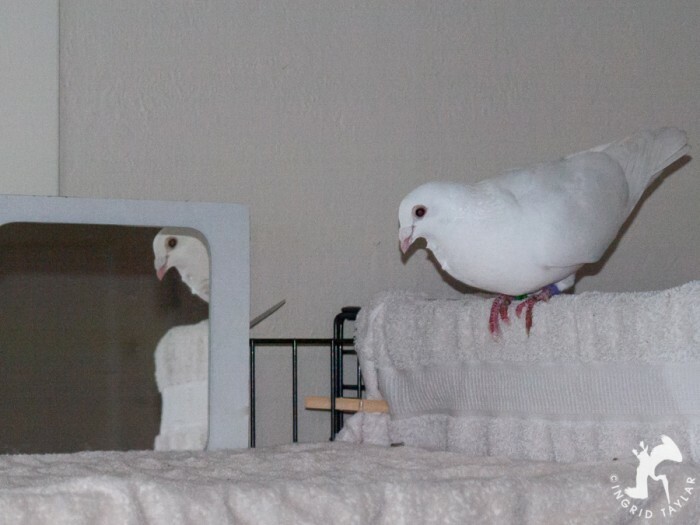 They became inseparable … except for those times when White preferred his own reflection to Blue’s elegant allure. We forgave White his moments as Narcissus, seeing as how he was a youthful one year to Blue’s saucy ten. Blue was no longer attentive to my deadlines. She had eyes only for White and he for her. When I say inseparable, I mean a shadow and reflection, a George and a Gracie … a Blue and a White in perfect symbiosis and contrast. We finally mustered the resolve to take White in to have his double bands removed as well. Neither Blue nor White relished the carrier nor the car nor the vet, but we couldn’t stand to see him pick at the bracelets he couldn’t remove on his own. White’s bands didn’t snap off as easily as Blue’s did. One was plastic fused to metal and pressed so tightly to his skin that removal was hazardous to his leg. 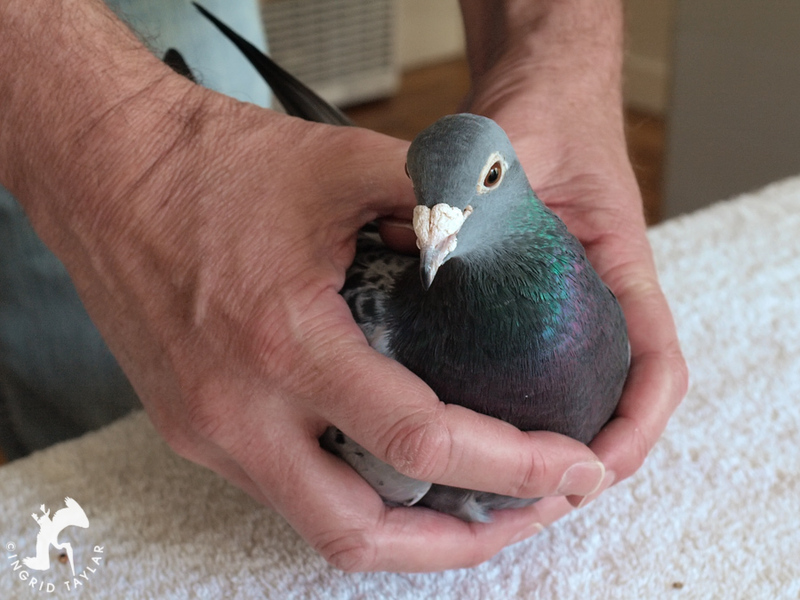 But once again, our vet, with extra care, freed this bird from the sentence he no longer had to serve. 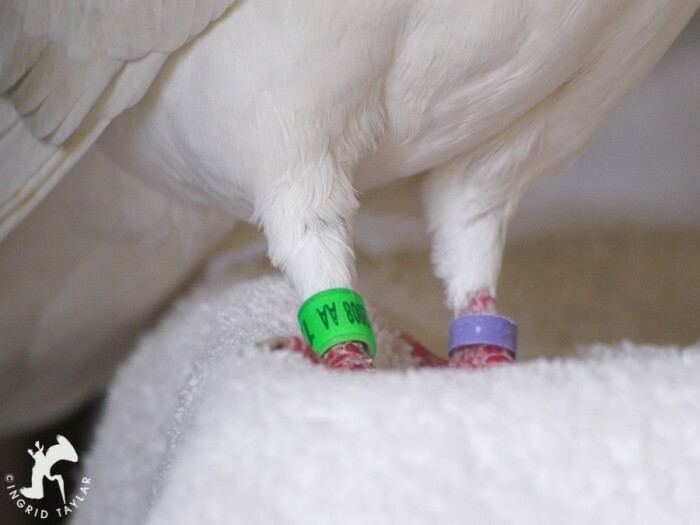 And White, too, just like Blue, spent the hours late into evening, marching, lifting and preening those ankles — skin now feeling a gentle beak and fresh air for the first time since White was banded as a baby. He just couldn’t look anything but starry and dreamy. 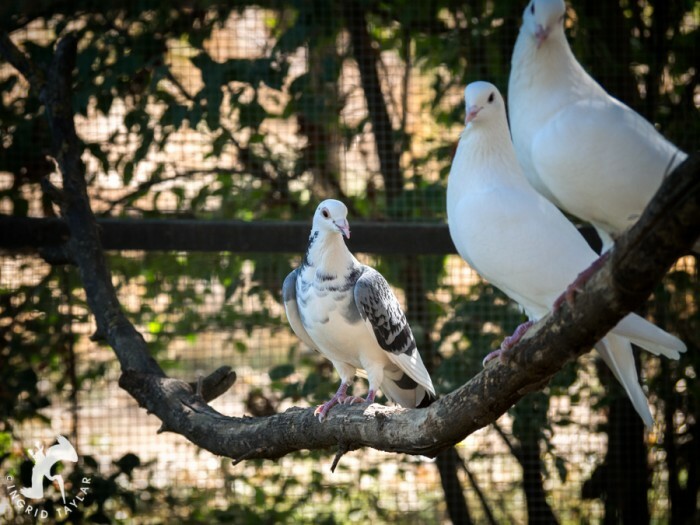 Blue and White moved to a bountiful flight aviary in Northern California, with grape vines growing inside in which Diamond doves nested. It was decked with swinging branches to perch on, baths made of stone and 50 pound bags of feed. 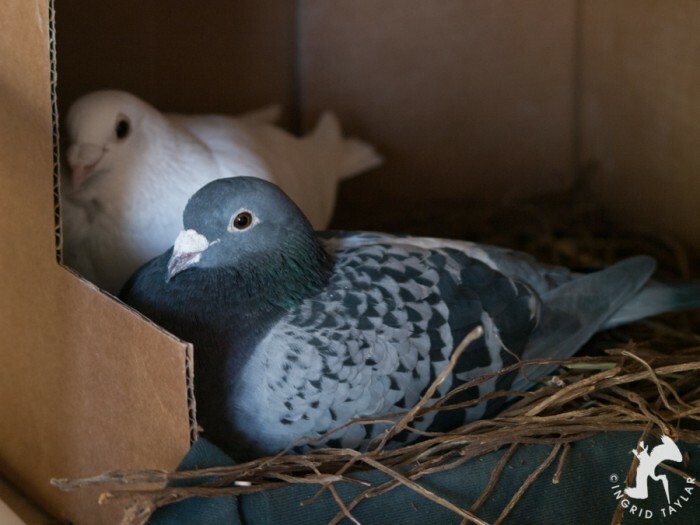 The two of them shared this world with a few rescued King Pigeons and ducks, and they remained inseparable, just as they’d been, until the day this past year when Blue became ill. We hoped to heal her but it was cancer gone horribly aggressive. So, with the help of a vet, Blue fell into her last sleep under the care of the person who gave her that aviary paradise, the warm Delta winds, California sunshine and grape vines. 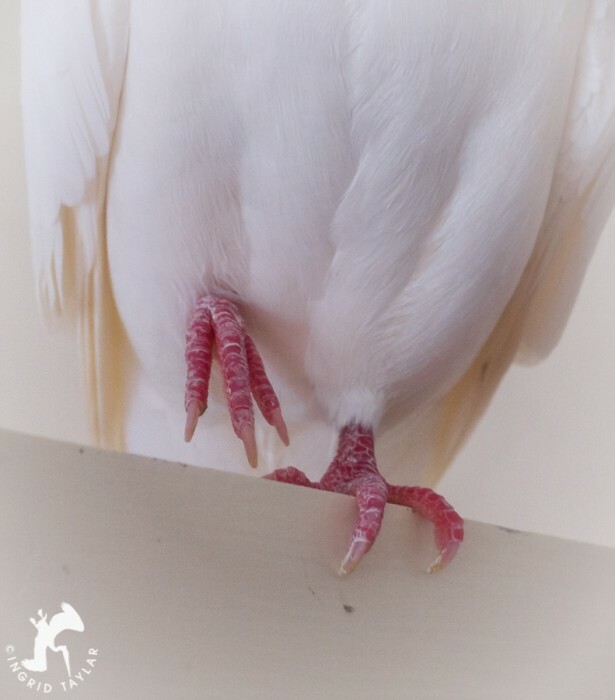 I cried many days after I first dropped Blue and White at their new aviary home, the loss felt immense. And, those tears gushed again when Blue died — that transcendent little spirit in feathered azul. What I didn’t know until after the fact was that Blue managed to leave behind a little Blue-and-White surprise. Two little Blue-and-White surprises, actually. 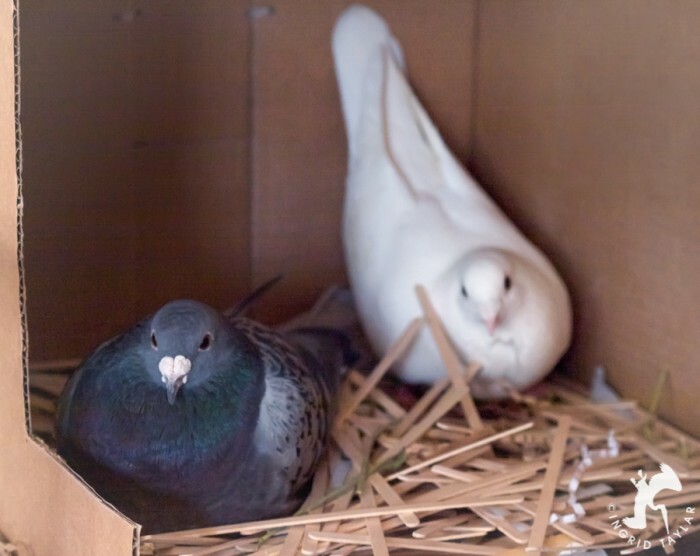 Our bonded duo had cleverly stashed their eggs behind a food bin so as to avoid detection. Then, when a substitute caretaker was in the house, a caretaker who didn’t know all of their Blue and White secrets, they managed to incubate those eggs to hatching. And as a consequence, they bred two healthy babies made of Blue … and made of White. There was recognition — but simultaneous trepidation. He didn’t know what it meant that I was there and he didn’t want to find out. This was one of the only in-focus shots I snapped of him as he raced out of arm’s reach and back to shelter. Lazing on a swinging perch was one of White’s progeny, gazing at me with the look of the ancients … carried down from the parents of Blue and her grandparents, and the parents of White and his grandparents. Little Blue-and-White was a blend of Blue and White so perfect as to be a living continuity of her mother. Later, inside the nesting shed, I found the two of Blue’s babies together … taut and muscular like their dear old mum, with the spirited eye of their dad. 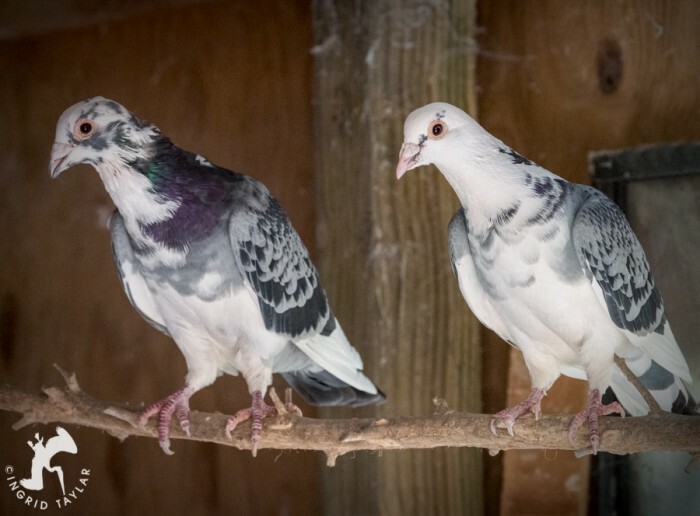 I suspect that like many first-generation kids of true survivors, these two can’t fully grasp what an arduous road it was for Blue and White, from their breeding boxes, and forced separations, the hundred-mile flights and raptor injuries, until finally blown off course into the unknown. 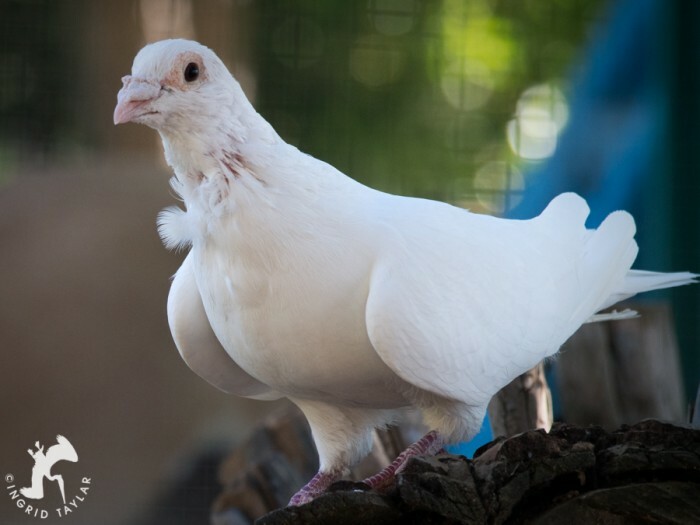 But, I’m sure they carry with them some innate spark of genes and ingenuity that Blue and White were handed themselves, a spark that connects them always to the birds they are — through the generations of birds they never knew. I thank Blue (our dear sweet late Chauncey, about whom I’ve written before) … and White (our beloved Clive) … with all of my heart … for connecting the two of us in a most poignant and unforgettable way to this existence outside our own. We will be forever cognizant, careful and compassionate about the lives of birds in their individual greatness, and in their shared magic as citizens of the grand and spectacular avian nation. In memoriam for Chauncey (Blue), and with love for her mate Clive (White) — two extraordinary birds you’ve met here before. 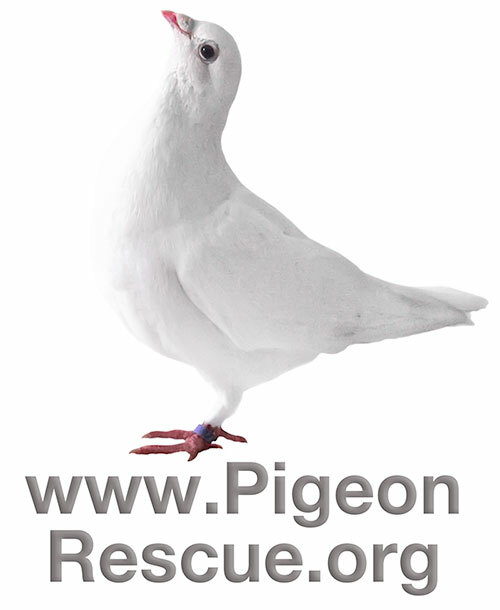 Ingrid, this is beautiful, and I love the how you made the icon of the pigeon in plain white for ‘Pigeon Rescue Org’. This is such a heartbreaking story. Thanks for sharing it. Maria, these two pigeons are among the reasons I think the common are gateway birds, as I’ve mentioned before. However a person gains their knowledge, appreciation and love for wildlife is critical. 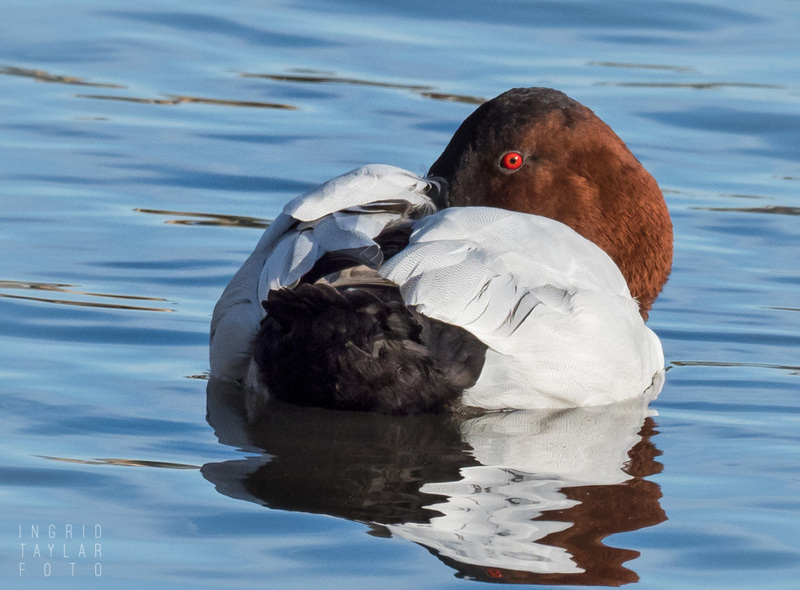 And often it’s through the most accessible birds … ones often overlooked but who are interesting in their own right once more closely observed and known. A beautiful tale indeed Ingrid. Thank you for bringing this hidden reality to our attention. 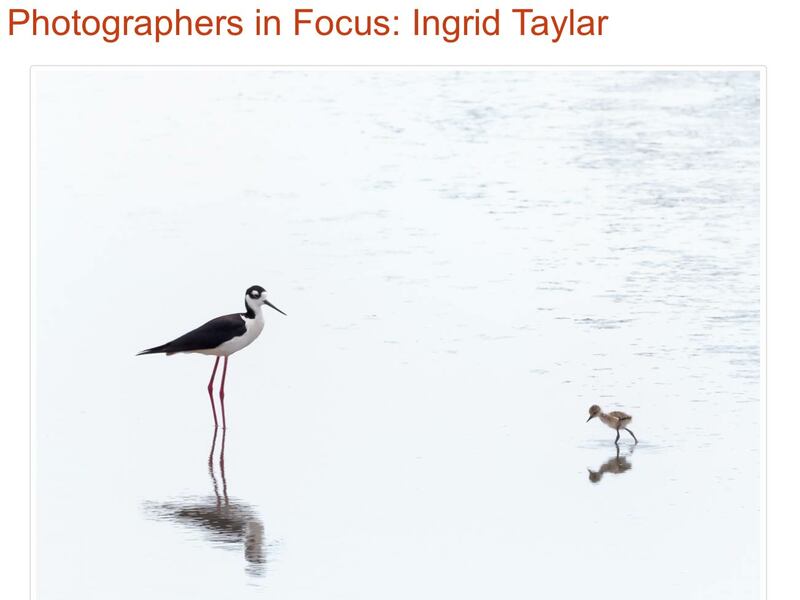 The birds are gorgeous and I love your new “large screen” blog theme! 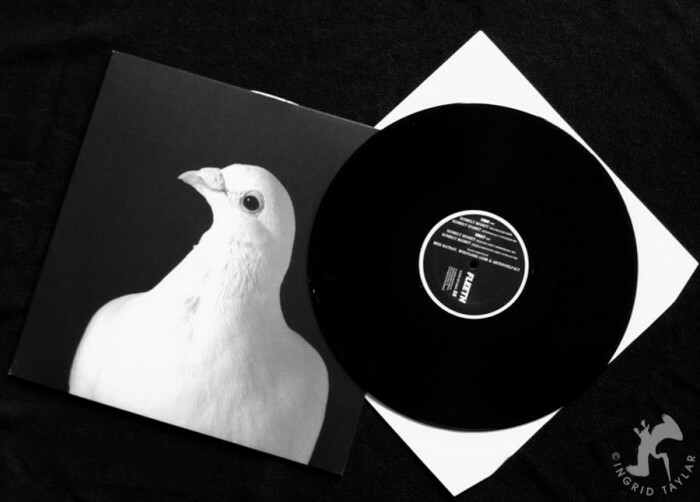 I know full well (as we’ve discussed previously) just how bonded one can become with pigeons. It’s been just over 50 years since I had my own birds as a young teenager and the memories are still fresh. And sweet. A beautifully written tribute, Ingrid. Ron, there were a few lingering emotions about those two for me … all of which came to fruition in their youngsters. I thought I might as well lay out the story in a slightly different way, and bring it to its sweet conclusion this time. Ingrid, this is such a beautifully written tribute. 🙂 I so often wished I was photographing them in beautiful light. I was always shooting at ISOs that taxed the capabilities of my little E-3. Our little flyer friends remain forever in our hearts . . .
Hugh, it’s impossible to see pigeons as anything but marvelous once you’ve learned their ways. 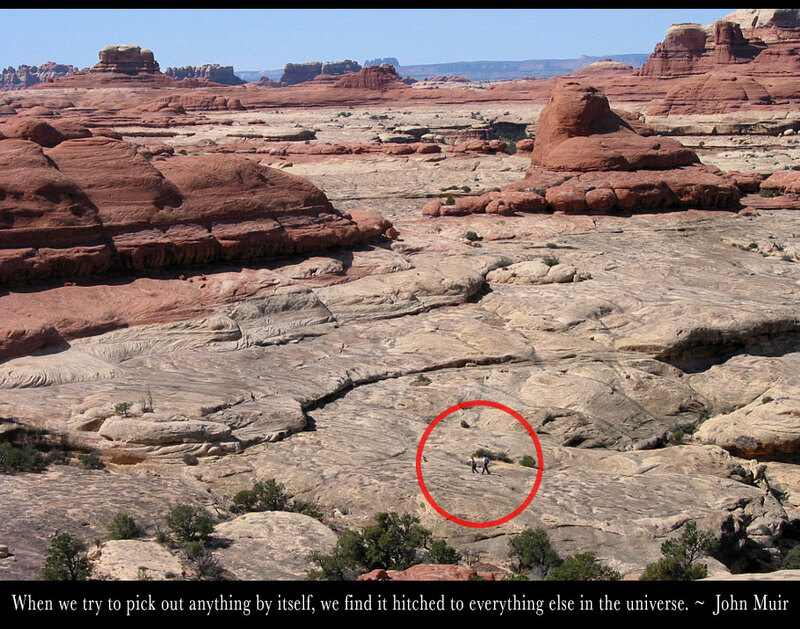 So beautiful – the words and the pictures both. Thank you Ingrid. Thanks for the kind comment, Martha. I love to pass pigeons when walking downtown. I love to feed pigeons in the grocery store parking lot. 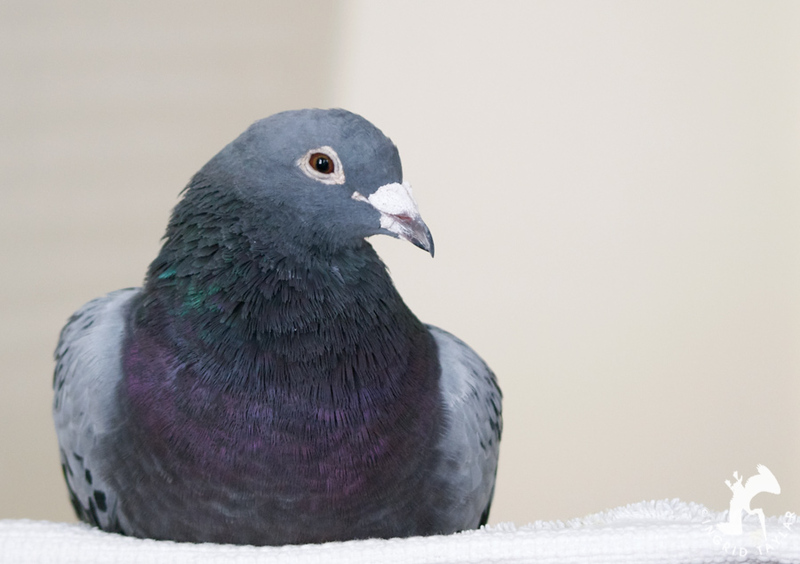 I love to speak to pigeons when I see them alighting on neighbors’ walls and arbors. And I love to imagine the day when Pennsylvania’s shameful pigeon shoots will be a relic of a dying barbaric past. Thanking you for the love and beauty through tears this beautiful story sparked. Ingrid, I’m not surprised at our synchronicity but truly delighted. I’m quite taken by your writing (as I keep saying :’) but when I reached out to you for Project Coyote I didn’t realize that we also shared a love of these animals, too. 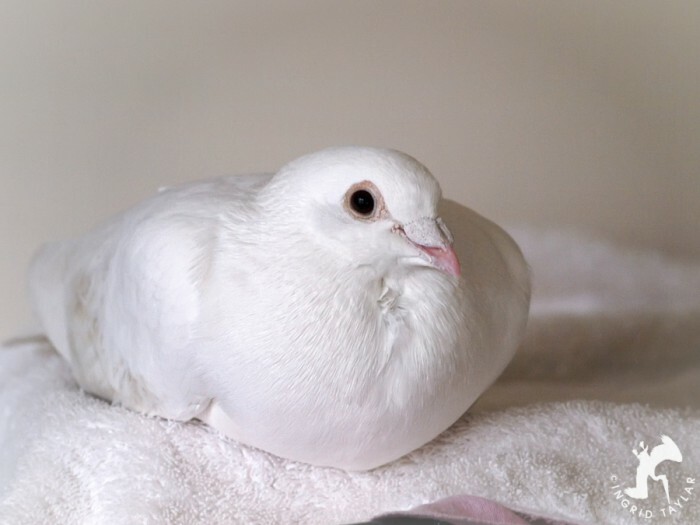 I’m quite involved with Elizabeth and MickaCoo, and have rescued doves of my own. 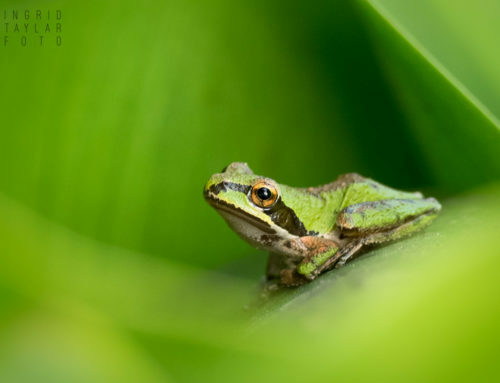 I’ve seen your stunning image used by MickaCoo and always wondered about its origin. 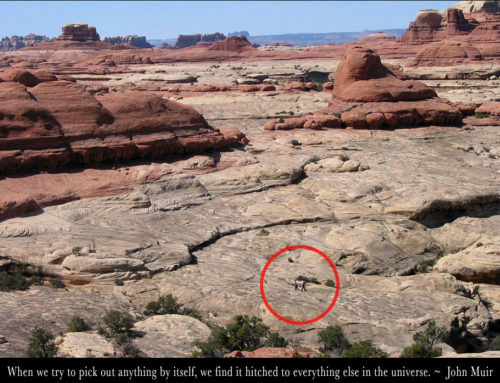 Coyotes, pigeons, starlings… are some of the most honorable souls I’ve ever known. I’m all for the underdogs of the world, for they have the fiercest hearts of all. And their champions, my closest friends, all share their qualities. I truly am delighted to meet you tho it seems it was inevitable. Gina, thank you … and I share your delight. I linked out to your “Wild Sound Stories” website and there’s a tiny bit of serendipity there. Last week, I cracked the cover (well, the Kindle cover) of David Rothenberg’s “Bug Music: How Insects Gave us Rhythm and Noise.” I got interested in acoustic ecology a few years back when I interviewed a filmmaker who did a documentary on Bay Area sound artists. My interest is sporadic, though, too diversified as I am these days. I spent a bit of time exploring at Wild Sound Stories with interest. I saw that Trish Carney is affiliated — she of bobcat fame. On the subject of underdogs, I couldn’t agree more. I’ve run into resistance in some of my circles, for my appreciation of the “non-native” species. I’ve said more than once that many have tried (and failed) to persuade me otherwise. It’s just that, for better and worse, I can’t find it in me to turn my heart on and off based on a species designation. I suspect life might be a tad easier if I could. Alas, I long ago gave up on the idea of an easy life. And in that context, the underdogs, as you suggest, are the most vivid illustrations of what it means to overcome adversity in this world. Now I know why I feel fiercely protective toward underdogs — coyote, pigeons, starlings, as well as rats and cockroaches and so-called vermin and pests. Because my heart, like yours Ingrid (and Gina), goes out to those who are vilified, persecuted, and, yes, murdered simply because they are too “common” in number or too “plain” in coloring or too “ugly” in overall appearance. While I understand why there are organizations devoted to saving endangered species and am grateful for them, I will not differentiate between those animals and all others when it comes to everyone’s intrinsic value, individual virtues, and sacred right-to-life. We are each here on earth to bless one another. Sometimes finding the inherent good in a member of a so-called “trash” species isn’t easy, but that’s how we learn to expand our hearts and grow in grace. I identify with your feelings. As a kid I used to love insects, earthworms, and precisely what you describe here as the ‘plain’ and ‘ugly’ underdogs. This made me struggle a little bit more ‘to fit in’ with the crowd. But even as an adult people still don’t understand why I will not kill a spider or step on a roach. 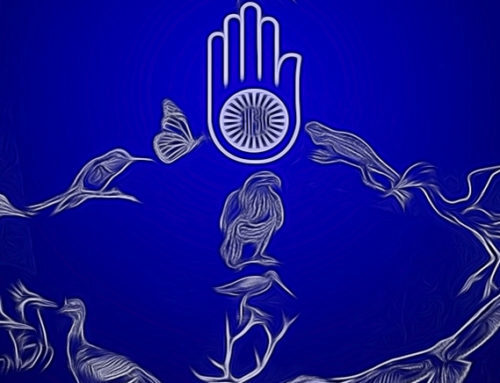 I feel it as spiritually evolving and going back to the primal instincts which links us precisely with all these ‘underdogs’ and ‘pests’, yet our egos takes us hostage in the human empire so we civilise and behave. So the facade is our armour to justify the prejudice, fear and annihilation. The everyday question of how much human facade has one witnessed in a day’s journey is the potpourri of human dilemmas which society nourishes and strives to maintain in a nucleus of its own. Meanwhile on the outside, the vermin and pests reproduce and unite to have a fest, while we by the laws of gravity begin to decay and lose this facade, precisely to meet with them once again, and reconcile. Now that’s a fascinating way of looking at our affection for the underdogs, Maria. I like the way you put it here: ” . 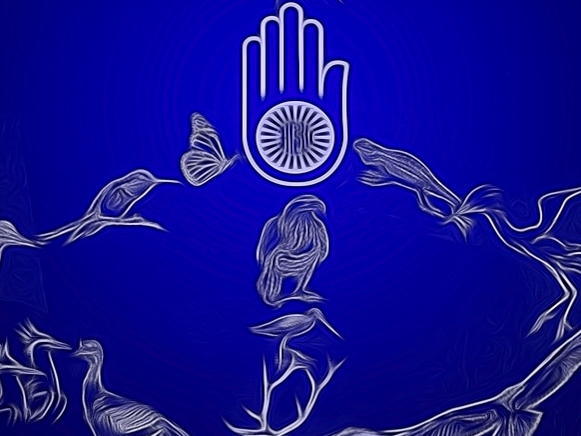 . . our egos take us hostage in the human empire, so we civilise and behave.” Also, ” . . . the facade is our armour to justify the prejudice, fear and annihilation.” Yes, our crumbling armour — a vain defense. Vain in both senses of the word: futile and narcissistic. Interesting how much might there is, by contrast, in meekness. . Thanks CQ. And I so much enjoy writing this and sharing it with persons such as you and other participants who share my views and understand what I mean. Although vermin and pests continue to be controlled in masses and mortify humans, they still rule the world, and we tend to think otherwise.